High quality mats easy, economical and safe way to cover your floor. The mat features flexible foam material with improved anti-slip and waterrepellant surface and is made of highly developed colored polymer foam with fine cell structure. Free of environmentally dangerous CFC gases, longer lasting than other regular interlocking mats. 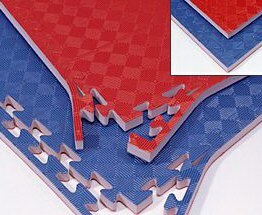 Red/blue mat is the color recognized by WTF and has been used at several major tournaments suchs as World Championships, Olympic & Panamerican Games, Etc. Great for martial arts like Taekwondo, Karate, Kung Fu, Day Care Centers, Play Rooms. Etc. Size in meters: 1m x 1m x 2.5cm. Colors shown may vary slightly from actual product colors. - Puzzle mats are completely portable! 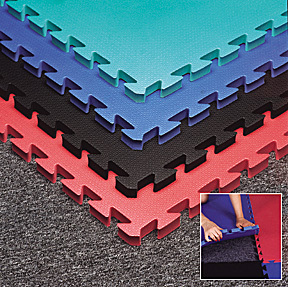 High quality mats easy, economical and safe way to cover your floor. Non-slip surface provide sure footed support for stepping and kicking drills. 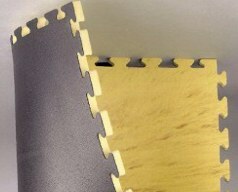 Puzzle design makes them easy to link together for a secure fit, plus they are completely portable. Great for martial arts like Taekwondo & Karate, Day Care Centers, play rooms. Etc. Size in meters: 1m x 1m x 2.2cm. Covered area 1100 Sq. Ft. Covered area 2177.7' Sq. Ft.
Use this formula to figure out how many mats you need!